Good agricultural practice recommendations have always stressed the importance of the ready availability of nitrogen, phosphorus and potassium for plant growth and development regardless of cropping system. However, for managed grazing systems, while there has been a good deal of recent research on nitrogen fertility, there has been virtually none on potassium. With the ever increasing costs of fertilizers and the demands on livestock farmers to develop nutrient management plans, it is critical that nutrient recommendations are based on sound research. This four-year research study examined the relationship between grazed pasture yield and other parameters with varying rates of potassium fertilization based on University of Wisconsin-Extension fertility recommendations. For a variety of reasons, with cost being a major one, the current fertilizer recommendations for pastures in Wisconsin are not based on research performed with grazing animals. They are based on mowed forage stands (without grazing animals) in Wisconsin and in other states and the recommendations have been extrapolated to pasture situations. They do not take into account nutrient cycling in managed grazing systems where animals are carefully rotated through a series of paddocks in order to optimize forage removal and nutrient recycling. Not applying needed phosphorus and potassium has commonly been thought to have a negative impact on the pasture yield and seasonal distribution of dry matter for grazing animals. It also has an effect on the species present in pastures. Grasses are more competitive for phosphorus and potassium than are legumes. Low soil levels of phosphorus and potassium give grasses a competitive advantage and may decrease the legume portion of the pasture over time. These two Grazing Lands Conservation Initiative (GLCI) on-farm demonstration and research (project nos. 628-2 and 935-3, respectively) projects aimed to demonstrate to graziers the importance of soil testing and the application of needed rates of phosphorus, potassium, and lime. These projects were conducted on two farms per county in Clark (4, 5) and Marathon (1, 2) from 2007 to 2010. In 2010, Farm 4 dropped from the project due to needed changes in the farm acreage. The amount of lime, phosphorus, and potassium applied were based on University of Wisconsin-Extension fertility recommendations in “Nutrient Application Guidelines for Field, Vegetable, and Fruit Crops” in Wisconsin, Bulletin A2809. Lime was not required at any of the farms. Phosphorus was applied annually at the optimum recommended rate. Potassium fertilizer was applied annually at different percents of the recommended optimum recommended K2O rate: 0 percent (treatment 1); 20 percent (treatment 2); 60 percent (treatment 3); and 100 percent (treatment 4). Three farms (2, 4, and 5) had a predicted yield of 2.0 to 3.0 tons of dry matter per acre and an optimum K2O rate of 130 pounds K2O per acre. One farm (1) had a predicted yield of 3.1 to 4.0 tons of dry matter per acre and an optimum K2O rate of 180 pounds K2O per acre. The two Marathon County farms (1 and 2) grazed beef herds. The two Clark County farms (4 and 5) grazed dairy herds. Soil tests were done in spring 2007, fall 2008, and fall 2010. The legume content of the pastures was measured in the spring 2007, fall 2008, and fall 2010. Pasture growth was measured before and after grazing events and dry matter production and amount grazed were calculated. Pasture forage quality was measured at alternate grazing events and a mean seasonal value for the measured parameters was used in the analysis. The net value of production for total grazed/clipped was calculated by comparing the cost of fertilizing with K2O with the yield and value of the fertilized pastures. The value of the fertilized pasture was set at $98.53 per ton dry matter which was the mean value of Grade One large round bales in the Midwest (from Jan. 1st, 2007 to August 31st, 2009). Potash was valued at the fall 2009 price of $550 per ton. An additional GLCI funded study (533-2) was performed at the Marshfield Agriculture Research Station (ARS) starting in 2006 and continued through spring soil sampling in 2010 to better understand the influence of fertility on common pasture forage species in the absence of the live cattle variable. Fertility treatments were based on soil test results with recommendations for 3.1 to 4.0 tons of dry matter per acre of forage based on “Nutrient Application Guidelines for Field, Vegetable, and Fruit Crops in Wisconsin, Bulletin A2809”. Treatments included an untreated check, 210 pounds K2O per acre, and two tons of manure spread after each harvest. Initial soil test levels measured in 2006 on this Withee silt loam soil were 6.7 to 6.8 soil pH, 2.8 to 2.9% soil organic matter, 53 to 56 ppm soil K2O, and 30 to 31 ppm soil P2O5. The potassium level at the start of the study was in the “very low” soil test category. Increasing the potash fertilization levels up to a maximum of 215 (farms 2, 4, 5) to 300 (farm 1) pounds per acre did not result in a significant increase in the total forage produced or grazed/clipped. 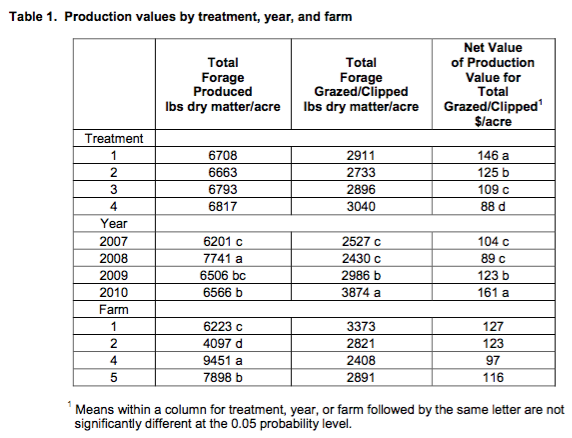 There were significant fertilizer treatment effects for the net value of production for total grazed/clipped. For the net value of production for total grazed/clipped (Table 1), treatment 1 was significantly greater than treatments 2 to 4. Treatment 4 was significantly less than treatments 1 to 3. The increase/decrease in total forage grazed/clipped (pounds dry matter/acre) compared to the control was as follows: treatment 1: 0; treatment 2: −178; treatment 3: −15; and treatment 4: +129. Since there was increasing costs as more potash fertilizer was applied and either a decrease or little increase in total forage grazed/clipped, these results were not surprising. There were significant year effects for all three production parameters. The 2008 values for the total forage produced were significantly higher than the other three years. The 2010 values for total forage grazed/clipped and net value of production for total grazed/clipped were significantly greater than the other three years. There were significant farm effects for the total forage produced. Farm four had the highest level of forage production and farm two had the lowest. For the total forage grazed and net value of production, there were no significant effects. 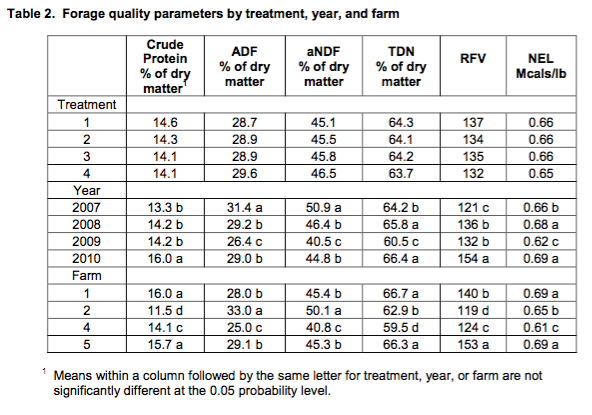 None of the forage quality parameters (Table 2) were significantly affected by the fertilizer treatments. One would have assumed that an increase in potassium fertilizer would have improved some of the forage quality parameters. There were significant year effects for all the forage quality parameters. There were no patterns in the differences. There were significant farm effects for all the parameters analyzed. There were no patterns in the differences. The 2007, 2008, and 2010 values for soil pH, soil percent organic matter (OM), soil phosphorus (P), soil potassium (K), and legume content data were analyzed separately. Farm four was not included in the analysis since soil tests and legume content data were not taken in 2010. 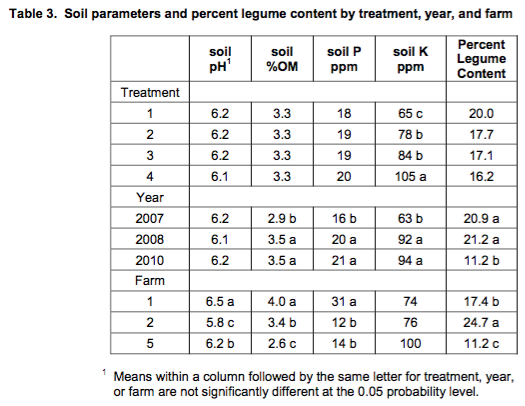 The high treatment (four) had a higher soil K level (104.7 ppm) than the other three treatments (Table 3). Treatments one and two were not significantly different from each other. Treatment one had the lowest value and was significantly different than the other three treatments. Since the potassium fertilizer rate was based on a higher yield than was achieved at the farms, it was not a surprise that the potassium level increased in the soil. There were significant year effects for soil percent OM, soil P, and soil K. Soil percent OM, soil P and soil K were higher in 2008 and 2010 compared to 2007. There were significant farm effects for soil pH, soil percent OM, and soil P. Farm one has significantly higher values for soil pH, soil %OM, and soil P than the other farms. Legume content (Table 3) which can be affected by potassium fertility (and other factors) was not significantly affected by the increasing rates of potassium fertilizer. It was significantly lower in 2010 compared to 2007 or 2008. Farm two had significantly higher percent legume content than the other farms. In the Marshfield ARS study, the addition of manure and potassium fertilizer had mixed effects on soil parameters and yield but not the percent legume content (Table 4). The addition of manure prevented soil organic matter from decreasing, as happened in the untreated and commercial fertilizer treatments. Manure maintained soil potassium levels similar to those at the beginning of the study resulting in a potassium level that was similar to the untreated check. With annual fertilizer applications of 210 pounds K2O per year for four years, the commercial fertilizer treatment increased soil potassium by over 100 ppm. With an average annual yield of 2.6 tons of dry matter per acre, plots were over fertilized. Adding potassium fertilizer did raise soil test potassium levels. Potassium fertilizer and manure, whether spread by hand or cattle, resulted in equal yields. Legume content was equal between potassium fertilizer and manure treatments. In summary, increasing the amount of potassium fertilizer did not increase the amount of pasture forage produced or grazed or most of the other parameters measured. The only significant fertilizer treatment effects were for the net value of production for total grazed/clipped and soil potassium level. These results were a surprise for two reasons. One, the soil test potassium levels (0 to 6 inch soil depth) at the start of the demonstration were in either the very low (farm 2 and 5) or low (farm 1) ranges and one would have thought that adding potassium fertilizer would have a significant effect. Second, potassium fertilizer was applied according to the University of Wisconsin-Extension fertility recommendations. Thus, the results bring into question the potassium fertility rates for beef and dairy animals grazing on pasture as are currently recommended. It would have been interesting to have done soil sampling at 6 to 12 inch, 12 to 24 inch, and 24 to 36 inch soil depths to determine what occurred with the subsoil fertility levels over time. The subsoil fertility groups are the underpinnings of phosphorus and potassium fertilizer recommendations. The results of soil testing with the long-term cropping systems research with the Wisconsin Integrated Cropping Systems Trials have demonstrated that subsoil potassium levels may decrease over time if crop removal exceeds potassium applications. The subsoil phosphorus levels appear to be unaffected. Further research on pasture potassium fertility around the state should be instituted soon. This research should be at various sites around the state with different soil types and geographic locations. The research could be done at both agricultural research stations and production farms for at least three years. M.C. Beatty and R.B. Corey. 1961. Subsoil fertility of Wisconsin soils. Wis. Acad. Rev. 9:22-23. Dennis Cosgrove. 2006. Nitrogen management in rotationally grazed pastures. Graziers Notebook Vol. 1: No.1. University of Wisconsin Cooperative Extension Service, Madison, WI. C.A.M. Laboski, J.B. Peters, and L.G. Bundy. 2006. Nutrient application guidelines for field, vegetable, and fruit crops in Wisconsin. University of Wisconsin Extension Service Bulletin A2809. University of Wisconsin Cooperative Extension Service, Madison, WI. J.L. Posner and J.L. Hedtcke. 2005. WICST potassium soil depth test results (0-6”, 6-12”, 12-24”, 24-36”) Arlington Ag Research Station. 10th Technical Report (2003 and 2004). p. 261. Dep. of Agronomy Mimeo. Available at http://wicst.wisc.edu/core-systems-trial/soil-fertility/wicst-soil-test-p-and-k-at-depth-arlington-site/. N. Schneider. 2010. Fertilizing Grass/Clover Mixtures. Clippings July 2010. Midwest Forage Association. St. Paul, MN. N. Schneider, and M. Bertram. 2008. Influence of fertility on pasture species diversity, yield, and quality. Available at http://winnebago.uwex.edu/files/2010/09/Influenceoffertilityonpasturediversityyieldandqualityweb.pdf University of Wisconsin Cooperative Extension Service, Madison, WI. Dan Undersander, Beth Albert, Dennis Cosgrove, Dennis Johnson, and Paul Peterson. 2002, 1991. Pastures for profit: A guide to rotational grazing. University of Wisconsin Extension Service Bulletin A3529. University of Wisconsin Cooperative Extension Service, Madison, WI.